No matter who wins Utah’s U.S. Senate race in November, the Beehive State will have an advocate in Washington, D.C., for moving marijuana off the list of Schedule 1 controlled substances, a designation that cannabis now shares with heroin, LSD and ecstasy. 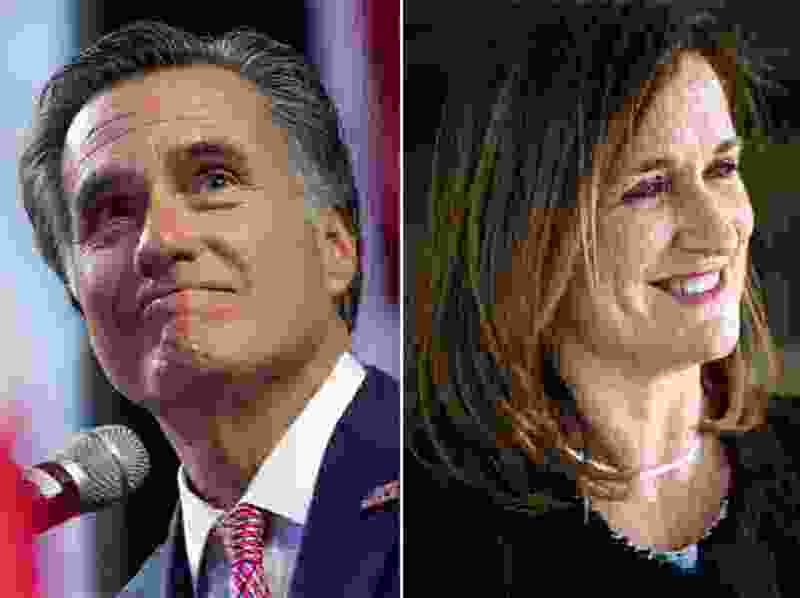 Republican Mitt Romney and Democrat Jenny Wilson told The Salt Lake Tribune that reclassification of marijuana is needed to facilitate research and use of cannabis products as a medical treatment. “Let’s take this off the category one designation and let it be evaluated through a normal FDA-type process,” Romney said, referring to the Food and Drug Administration. Wilson said it’s “ridiculous” that cannabis remains on the Schedule 1 list, and faulted Utah’s senators and representatives for failing to take action. The candidates' comments came during separate interviews on the subject of marijuana legalization, Medicaid expansion and health care reform. While they both stated support for medical marijuana as an option for patients, Romney and Wilson disagreed on the mechanism for allowing Utahns access to the drug. Wilson supports Proposition 2, an initiative on the state’s November ballot that would allow qualifying patients with a doctor’s recommendation to obtain a medical marijuana card and purchase cannabis from private dispensaries. But Romney — who has added his name to the anti-Proposition 2 Drug Safe Utah coalition — prefers a legislative solution to Proposition 2. And like The Church of Jesus Christ of Latter-day Saints, Romney said a special session of the Legislature may be appropriate to move as rapidly as possible on the issue. Beyond medical uses, Romney and Wilson said they oppose the legalization of cannabis for adult recreational use in a form similar to alcohol or tobacco products. Marijuana should be kept out of supermarkets, Wilson said, but individual states should retain the discretion to legalize recreational cannabis use, as many already have. Romney said he has discussed the issue of recreational use with residents of Colorado, including the state’s Democratic Gov. John Hickenlooper, who believe legalization has had a negative impact on the state. Asked if the federal government should enforce a nationwide ban on recreational cannabis, Romney said he was not yet able to state a position. “I’d need to see more information about what impact it is having elsewhere before I could make that call," he said. 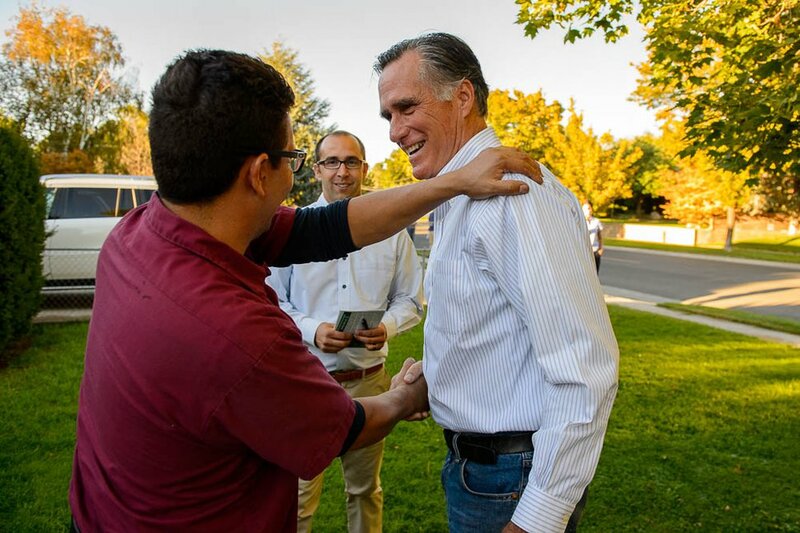 (Trent Nelson | The Salt Lake Tribune) Mitt Romney gets a pat on the back from Dan Sanchez while canvassing in Murray with Republican House candidate Robert Edgel, Thursday Sept. 20, 2018. On Proposition 2, Romney said he objects to the initiative’s private dispensaries and casual pharmaceutical structure. Federal law impedes the use of traditional prescriptions and pharmacies, but he said a state-run dispensary and more precise doctor’s recommendations can be established in the short term. “What I don’t favor would be pot shops selling brownies and gummy bears laced with marijuana to people who did not have a legitimate prescription from a doctor,” he said. Wilson said that where there are flaws in the initiative, it is the result of inaction by state and federal leaders. With no movement on legalization, she said, Utahns took charge by writing a proposal that could fit within the existing legal landscape. Romney and Wilson are similarly split on Utah’s Proposition 3, which would combine roughly $90 million in state revenue — through a 0.15 percent sales tax increase — with $800 million in federal funding to fully expand Medicaid and provide medical coverage to 150,000 low-income Utahns. The initiative comes on the heels of a partial expansion plan approved by lawmakers, which seeks a federal waiver from the requirements of the Affordable Care Act, or Obamacare, to cover roughly 70,000 Utahns. Approval or denial of the state’s proposal is pending, while Proposition 3 would not require a waiver or federal endorsement. Wilson said Utah’s leaders have turned away more than $1 billion in federal health care funds that could have aided in the fight against opioid addiction and strengthened the safety net for Utahns who are desperate for health care. She said she has supported full expansion “from Day One,” and that Utah’s communities would be healthier today if the state had moved forward sooner. “I believe the single biggest failure of our Legislature over the past decade is their inability, or their unwillingness, to do a significant expansion on Medicaid,” she said. 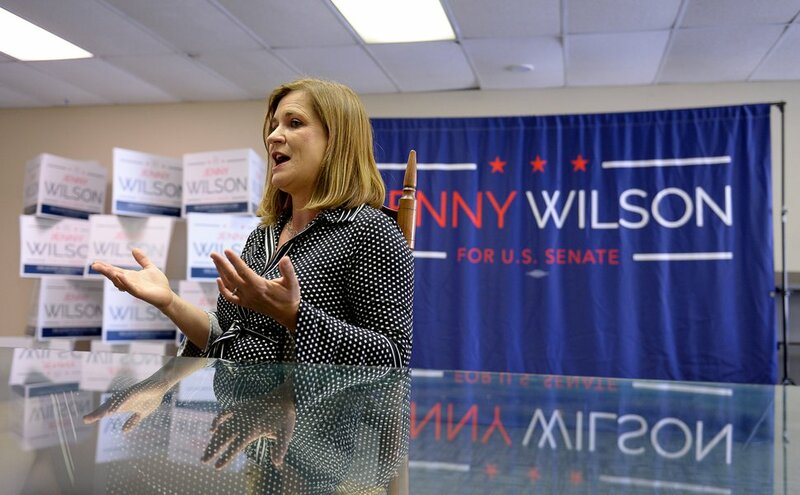 (Francisco Kjolseth | Tribune file photo) U.S. Senate candidate Jenny Wilson sits down for an interview in Salt Lake City to talk about her campaign and the issues affecting Utah on Thursday, Aug. 30, 2018. But Romney praised the state’s partial approach, which uses work requirements and a lower income threshold to limit enrollment and, by extension, costs. If the federal government’s share of health care costs were to change, he said, full-expansion states would be on the hook to make up the difference. As a senator, Romney said he would work hard to persuade the federal Department of Health and Human Services to approve Utah’s Medicaid waiver. “What the state has arrived at is a better way,” he said. As governor of Massachusetts from 2003 to 2007, Romney signed a state law that often has been called a template for Obamacare. While there are differences, both have some key similarities, according to FactCheck.org, including Medicaid expansion, an individual mandate for people to buy insurance or pay a penalty (Congress recently repealed this provision in the Affordable Care Act) and subsidies for low-income residents. Romney has often attempted to distinguish so-called “Romneycare” from “Obamacare,” by saying the former was a state-specific solution — not a national mandate for states that didn’t want it. Wilson noted that Obamacare has made it through dozens of repeal attempts largely intact, including now that both chambers of Congress and the White House are controlled by Republicans. While there is always the potential for unseen challenges, Wilson said she does not believe the fears that federal investment will evaporate and leave full-expansion states with a crippling price tag. The election cycle has generated renewed talk of future health care legislation, including the expansion of Obamacare, block grants for state-run programs, tax credits to purchase insurance and Medicare-for-all, a proposal to establish a universal public health care system. “The American people are not going to accept — and I would not encourage them to accept — a government-run health care system that we are all a member of,” he said. Wilson said there is no one proposal that she supports. But she added that there are principles of Medicare-for-all, like the expansion of public programs to provide an option to patients, that are positive. Too many people lack coverage, Wilson said, but even those who are insured are paying too much to access medical services. She said that “likely” means restoring the Affordable Care Act’s individual mandate in order to bring more people into the system and drive down costs. Beyond that, she said there is need for a comprehensive look at new structures for health care in the United States. Romney lauded a plan promoted by U.S. House Speaker Paul Ryan, R-Wis., (his 2012 running mate) that would provide a refundable tax credit to purchase insurance for individuals who don’t have access to an employer-sponsored insurance plan. The credit would allow a standardized amount to individuals earning up to roughly $75,000 a year, or $120,000 for a couple, and would taper off above that level. Medicaid would continue to be available at the lowest income levels, he said, while affluent Americans with “gold-plated” insurance plans would no longer be able to claim a tax exemption. The proposal would mean a significant shift in the nation’s health care programs. But Romney said the legislation could be approved and enacted relatively quickly if Republicans succeed in retaining the House and Senate after the midterm elections. Beyond that specific legislation, Romney said he supports protections for patients with pre-existing conditions, saying it’s “unacceptable” that a sick person would be denied insurance. He also suggested that states be given their allotment of federal funding to use as they see fit. Wilson said she is open to whatever can be done to get more people insured and lower the cost of accessing medical services. But she emphasized the need for action on opioids, including investment in training for law enforcement and community organizations and programs that help habitual opioid users access overdose-reversal medications.